This is an exciting post for me and I'll make it short and sweet. 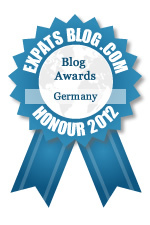 I was contacted a few months ago by expatsblog.com letting me know that they had chosen my blog for a contest they were running. While I didn't get first place, I did get an honorable mention! I wanted to say a HUGE thank you to those of you who take the time to read my blog and like or comment on my posts. It really means a lot to me and is a huge reason why I am keeping up with it. So, thank you again, and if you ever have any questions please feel free to send me an email through the 'contact' link! American Expat living in Southern Germany. Writing about expat life and my travels, and photographing it all along the way!